SnugFleece wool mattress pads are hand crafted in the USA. The wool used in the manufacturing of these high quality pads is 100% American virgin wool. SnugFleece Woolens uses a thermal fleece laminating machine that actually builds the mattress pad one row at a time, This unique laminating process enables SnugFleece to bind the wool in Individual rows that overlap one another to a pure cotton backing, much like roof shingles, thereby creating a thick plush pad. “SnugFleece Original” is one of SnugFleece Woolens thickest pads and by far one of the best wool pads of its kind available. Sleep studies conducted by the American Wool Council have shown that, when you sleep on wool, you sleep more soundly and are less likely to toss, turn, and wake up throughout the night. • SnugFleece Original 1 1/2″ to 1 3/4″ pile height. • SnugFleece II 1 1/2″ to 1 3/4″ pile height. • SnugSoft Elite 1 1/2″ pile height. • SnugSoft Imperial 1 1/4″ pile height. • SnugSoft Deluxe 1″ pile height. 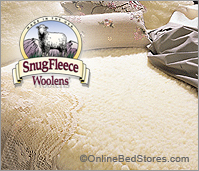 SnugFleece Original,the ultimate in sleeping comfort, 1 1/2″ to 1 3/4″ pile height.